We had been thinking about forming our own clogging group for a couple of years. There were 9 individual cloggers who seemed to have similar philosophies about clogging and performing in shows, similar dance styles, had a liking for the same types of music, and enjoyed each other's company. We finally decided to "take the plunge". We had no idea it would take off the way it did. One Sunday afternoon in the spring of 1997, we found ourselves in the basement of a church discussing how to get an exhibition group off the ground, what kind of time and money commitment it would take, selecting a color theme for the group, and what to call ourselves. The next thing we knew, we were designing logos and letterhead, ordering silk-screened polo shirts and were back in that same church basement with 2 sewing machines, 2 sergers, and 9 dancers in the middle of mass producing black 6-gored clogging skirts. We decided to call ourselves Prairie Thunder since all of our charter members resided on one or another historical prairie. The Arlington Prairie is the home of Nicole and Sandy. The Empire Prairie is the birthplace of Theresa. The Sun Prairie is the home of Kristi and Marion. The Windsor Prairie houses the rest of our charter members...Jackie, Mary, Robin, and Tykie. As we danced to prepare our first show, we couldn't help but notice the noise that emanated from our taps on the floor forming an image in our minds of a storm developing over the prairies, and the first hint it gave to its residents of its approach was the sound of thunder. Hence our name...Prairie Thunder! 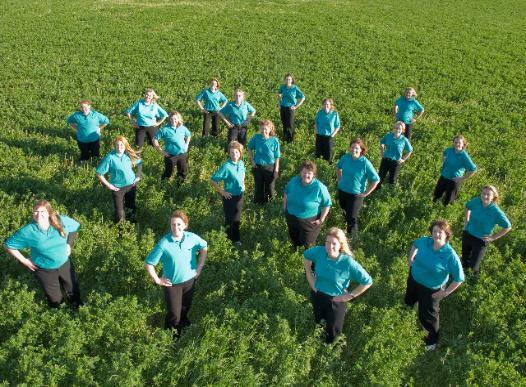 Copyright 2013 Prairie Thunder Cloggers. All rights reserved.